In addition to the image, the Deck view will display two text columns as well as any action buttons for phone numbers or emails. The display columns are chosen in the following order: Row Label, Virtual Columns of type Name, Name type columns, key columns, required columns, normal columns in sheet order. The deck view also has an option to select a layer of data to display as a secondary view. This 'nested view' provides a way to visualize lists of related data created by building references between tables. To enable a nested view, app creators can simply look for the 'Nested Table Column' field within the deck view to choose a 'related' list of items. Customize the view type of that related list by finding the corresponding 'inline' ref view that was automatically created when the relationship was created. See the Deck view in the Lead Tracking sample app. See the Table view in the Delivery Tracking sample app. 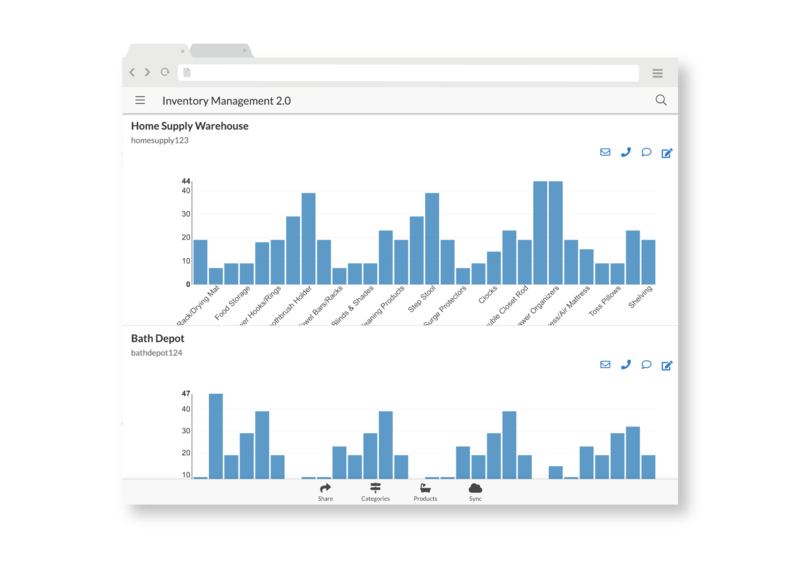 See the Nested View in a Deck View in the Inventory Management sample app. Small: appropriate for thumbnail images. Medium: fits two images side by side on a phone screen. Large: shows large images full-width with a vertical scroll. As with the List view, you can choose a column to sort the order of presentation of the data. See how the gallery works in our Product Catalog sample app. 4. Detail (previously Slideshow): this view is used to show details about a record and page left and right through multiple records. This view is automatically used when an item is selected in the Table, Deck, and Gallery view. You can configure this automatic view by creating a UX control of type "detail" and position "ref" based on the same data source. The view settings include options such as image presentation, column order, and QuickEdit columns. 5. Map: this view displays Address, XY, and LatLong columns on a map. See more details on working with maps. See how maps work in our Contact Directory sample app. Read a detailed blog post about the map feature. How many individual series 'lines' do you draw? What values are on the X and Y axes? What chart display type do you use?-- line, bar chart, etc. Row Series chart-- this is appropriate for spreadsheet data where most of the data is numeric on a uniform scale (eg: monthly sales data). Every row forms a series, each of which is identified by the row key. You choose a subset of the column names that will be charted on the X axis. The Y axis is based on the numeric values in the row cells. You can choose a line chart, a bar chart, or a stacked bar chart as the display type. A good example of a Row Series chart is the 'By Month' view in the Sales Report sample. Column Series chart-- this is appropriate for spreadsheet data with just a few rows corresponding to items to compare (eg: monthly sales data by category). Every column forms a series, each of which is identified by the column name. Each row (using its row key column) forms one entry on the X axis. The Y axis is based on the numeric values in the row cells. You can choose a line chart, a bar chart or a stacked bar chart as the display type. A good example of a Column Series chart is the 'By Type' view in the Sales Report sample. Histogram-- this is a special kind of bar chart to show aggregate distributions. For example, if you want to see the number of customers who purchased each automobile model, you specify the column whose values will be aggregated. The X axis gets one entry for each unique value in this column and the Y axis shows the count of the number of rows that have that value in that column. 7. Form: Your apps give you the ability to capture signatures, photos, and location services. You can use AppSheet for Google Forms to both distribute forms through a mobile app as well as use a mobile app to view and interact with form responses. But if you're only using your app to distribute forms, you probably don't want your app showing each user's response, and instead have each new user simply be able to fill out a new form with the app. In the Editor, click the UX tab, then the "Add New View" button. From there, choose "form" from the list of view types. New guests to the form will only be able to fill out a new form and will not see entries made by previous users. AppSheet also helps you unlock mobile-specific features for your Forms that the web cannot capture. Your apps give you the ability to capture signatures, photos, and location services. 8. Dashboard: The dashboard view allows you to show multiple other views in one place. Currently Calendars, Maps, Charts, Gallery, Deck, Table, and Detail views can be added to the Dashboard. If the view content is related or from the same table as data in other views, enabling 'Interactive Mode' allows content to be dynamically updated as different entries are selected. On a tablet or desktop, the specified dashboard views will be shown in an automatically-sized grid that can be customized by the app user. However, on small screens, including phones, the dashboard will show all the views in a long vertical list. In addition to choosing which views to include, you can also specify them to be Large or Small. Large views will be twice the size of small views on the grid. On phones, the Large/Small option is ignored. Read a detailed blog post about presentation types.